"She was once a hero...."
We begin with a former hero. She was a police officer. She had been betrayed by her crooked partner (and a largely crooked precinct). Led into an ambush disguised as a drug bust gone bad, she'd been disgraced, drummed out of the force, and left paralyzed from the waist down. She is now at the lowest point in her life. She wallows in self-pity. Miserable over her condition, inconsolable, convinced that she has been ripped off by life and fate, she's alienated almost any who cared about her. The rest have been pushed away by her increasing alcoholism and overwhelming anger. And Satan bestows the power of the Vengeance Spirit. 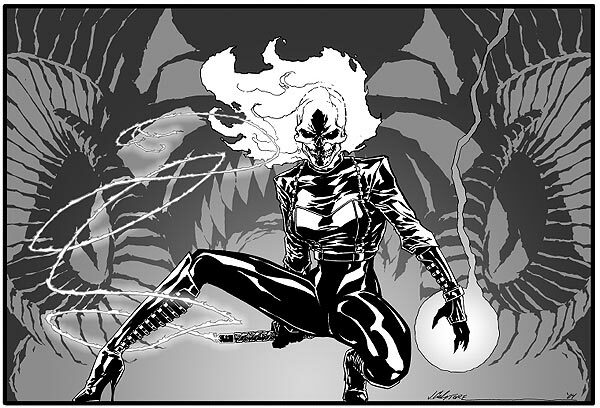 In a tornado of flame and brimstone, she becomes the GHOST RIDER; in the flush of power coursing through her, she immediately sets out to take her vengeance on those responsible for her condition. And does so with terrifying ease, and equally terrifying gusto. But once her vengeance is completed, her anger sated though probably not satisfied, she sees things clearly. She sees what she is; the hero that she was and the monster she's let herself become. She is horrified. The thematic question here is: What is a hero? Can she be a hero again despite the forces driving her, both externally and internally. Especially when she can not easily ignore the Vengeance Spirit. And the Prince of Lies never gives exactly what he promises, which she discovers the moment she changes back to her mortal self. In human form, her legs are still paralyzed. She still so hates her condition, yet the only way out of it is to become the GHOST RIDER. Satan would play a continuing part in the story. Sometimes only as a specter, he would also at times be a manipulator and antagonist, though not in the way he appeared in the original series. In this incarnation of the GHOST RIDER, Satan has no wish, nor any need to kill our heroine. He already has her soul by contract. He wants her to live up to that contract, to be a good little Vengeance Spirit and send him fresh souls on a regular basis. So his influence on the flow of the stories would be through his efforts to get her to fulfill the role he's given her; sometimes surreptitiously and sometimes directly, sometimes cunningly and sometimes violently. The Lord of Hell is not wisely denied. Note; This idea was pitched a few years before the show REAPER, (a show I really enjoy) with which it shares some basic ideas.